I will always be impressed when someone can make something out of almost nothing. When that something is different than usual, I’m even more in awe of the skill that comes with that thought in the first place. At Txikito, there are some skillful people in the kitchen. Take my silverfish salad. Silverfish is easy to find in Chinatown; and cheap, too. At Txikito, they toss them in a light batter, fry to make them crunchy and serve them atop a bowl of wild arugula leaves. Then there are the leeks; poached and then drizzled in vinaigrette and sprinkled with chopped boiled egg. The dish is similar to one of Blue Ribbon’s signature dishes and it worked just fine on our table full of pork. My ultimate favorite “cheap” dish was the beef tongue, made crispy and served with mustard and cornichons. I relished the fact that the other two people at our table ate them–and liked them–because they had no idea what they were eating. And then there are the dishes that take a lot of preparation and warrant the price on the menu. 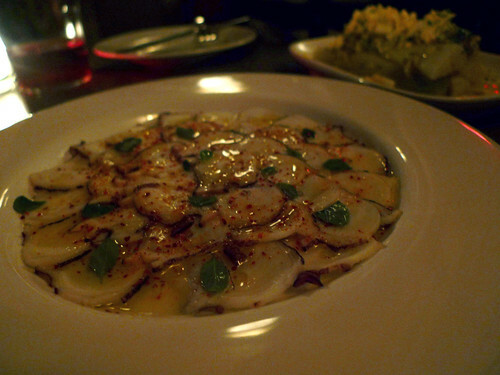 I’ve eaten octopus carpaccio a few times before, but the Txikito version is one of the best ones. Perhaps tenderized by slapping each piece against a chopping board (a la Jewel Bako) and then drizzled with oil, lemon juice, marjoram and some chili, it was tender and crunchy at the same time: a texture that might be weird to some, but really good to me. The suckling pig special was the most expensive on our bill at $30, but it was succulent and tasty; the meat melting off the bones and all the fat dripping down the crispy skin–pure heaven. The blistered serrano peppers were hotter in the end than I would have liked; the Catalan version I savored in Barcelona was much sweeter. The crab meat gratin was tasty but unexciting. The blood sausage was wrapped in crispy egg-roll skin; it killed me to pay $8 for them. The small sandwiches of unsmoked bacon seemed out of place with the dinner items, but I liked the finger-food presentation. Our waitress was very patient and brought out everything in perfect timing and order. One of us never experienced Spanish pintxos before, so I watched the waitress patiently explain the food choices to him. We selected a lot of meat, but she made sure the seafood and vegetables came in between. On a busy Saturday night, they let us stay until 11:30pm even though we were one of the last tables around. As we exited the restaurant, our inexperienced friend said, That has got to be one of the best dinners I’ve had in a long time. Txikito is good for that, but also excellent for someone like me. the food there is amazing….